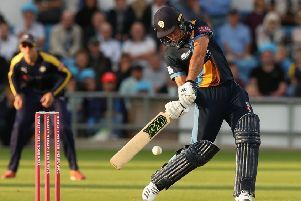 A half-century from Billy Godleman underpinned by some explosive hitting by Hardus Viljoen helped Derbyshire Falcons maintain their current mini-revival by overhauling a modest total by Leicestershire Foxes, who have so far lost all four of their home fixtures in the Vitality T20 Blast while winning their three away from Grace Road. Godleman recovered from running out the Falcons’ danger man Calum MacLeod off the second ball as the Falcons chased a target of 150, his unbeaten 57 steering his side to back-to-back wins in the competition after their first four matches ended in defeat. Viljoen smashed 32 off just 16 balls to snuff out any real hope of the Foxes keeping their East Midlands rivals below their total of 149-5 on a used pitch. When he was dismissed, skying one to mid-off off Neil Dexter, the target was down to 33 off 30 deliveries and his dismissal merely prefaced the arrival of skipper Gary Wilson, whose 21 off 11 balls helped Godleman finish the job at the end of a good week for the county, who completed only their second Championship win of the season at Chesterfield on Wednesday. The chase had begun disastrously for the Falcons with Macleod, whose 58-ball century against Northamptonshire last time out enabled his side to register a first win of the season, run out without facing a ball as Godleman called a quick single only for Colin Ackerman to beat his partner with a direct hit running in from mid-wicket. With a build-up of threatening cloud away to the east and reports of rain elsewhere, Leicestershire were anxious to complete the five overs minimum required in the Falcons innings to ensure a result, which produced another dividend for the home side in the event, Wayne Madsen hitting Ben Raine straight to mid-off. But then a rather loose over from Mohammad Abbas, conceding three boundaries, handed the initiative back to the visiting side, who were 45-2 at the end of the powerplay, compared with the Foxes’ 38-1 at the same stage. At the halfway stage, the Falcons needed 82 more with eight wickets in hand, although they suffered a setback in the 11th over as 22-year-old Anuj Dal, a tidy right-handed who had batted nicely in only his fourth senior match, was bowled when he attempted to haul a ball from Neil Dexter in the direction of square leg, but new batsman Hardus Viljoen punished Gavin Griffiths with a couple of boundaries in the next over to keep his side on track. The Falcons became adept at pushing singles and the Foxes were not able to come up with too many dot balls, and when Viljoen lofted Mohammad Nabi’s off-spin high over probably the longest boundary on the ground they looked to have the chase in their grasp, with 47 needed off the final six overs. Viljoen fell with 33 still needed but Wilson’s experience ensured there were no alarms as the target was reached with eight balls to spare. Mark Cosgrove’s 65 off 53 balls was the mainstay of a Foxes innings that began explosively with Dexter crashing Madsen’s opening over for six and four and then falling leg before attempting a paddle sweep. On a sluggish pitch that made fluent scoring difficult, the Falcons bowled tight disciplined lines and conceded only four boundaries during the powerplay overs. Cameron Delport, who never looked in good touch, thick edged Ravi Rampaul to short third man, and at the halfway stage the total was a modest 58-2. Raine went for just six after a painful innings that saw him twice on the deck, hit once in the lower abdomen and then on the ankle, and there was no significant acceleration in the scoring rate until Cosgrove got hold of Viljoen with a six and two fours in the 13th over. It prefaced a better finish for the home side, the last eight overs adding 82, with Ackermann, who hit the ball out of the ground at the Pavilion End off Rampaul, and Mohammad Nabi maintaining the momentum after Cosgrove missed a Rampaul slower ball. Nabi’s powerful and sometimes innovative hitting brought him 18 from 13 balls to swell the total to 149, which at least gave the Foxes more to defend than once looked likely.